What was the first cereal to include marshmallow pieces? 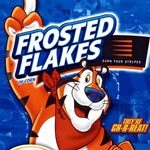 Tony The Tiger has been the mascot for Frosted Flakes Cereal since it's introduction in 1952 when it was called Sugar Frosted Flakes. 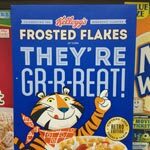 The cereal has used the tag lines "They Bring out the tiger in you" and "The taste adults have grown to love", but the most popular line is, by far, Tony's deep-throated "They're Grrreat!" This cereal was known as Sugar Frosted Flakes until around 1984. 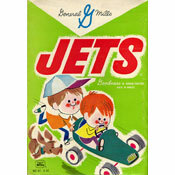 In the 1970's, the word "sugar" began to appear smaller on the box. 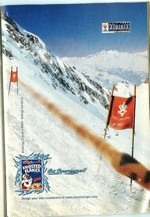 In the the early 80's, it was removed. These are the most recent images. 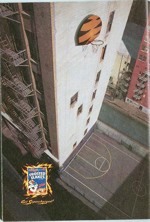 Click here to see all pictures for Frosted Flakes (Kellogg's). 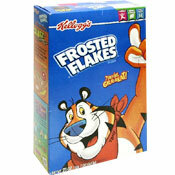 What do you think of Frosted Flakes (Kellogg's)? 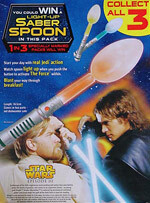 View all 33 comments for this cereal. 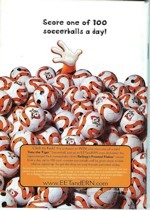 It's still a great cereal. Thurl Ravenscroft also voiced Billy Bass, the Russian cat in Aristocats. Tony the Tiger was voiced for many years in commercials by Thurl Ravenscroft, also known as the deep-throated singer of the song, 'You're A Mean One, Mr. Grinch'. Also was the voice of Kirby in 'The Brave Little Toaster' (1987). This is a great cereal! I love it! They get soggy too fast. I never understood why they dropped the word 'Sugar' from the name. They're great! Amazing! This cereal is fantastic and I hope that it stays around forever. There Grrrrrrrrrrrrreat! They really are. One of my favorites since I was small.